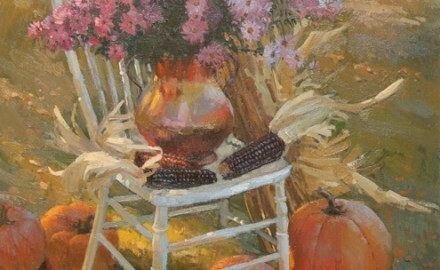 Recognized for his depiction of colorful outdoor garden views and unadorned rural scenes, Don Ricks is unsurpassed for the simplicity and beauty of his oil paintings. His simple still lifes and realistic yet stylistic depiction of barnyard animals and farmyard compositions remain an identifiable hallmark of his work. Rural landscapes of western settings are also favorite subjects of Ricks. Don Ricks assisted Russianñborn master painter Sergei Bongart for many years in workshops in Idaho and used the Idaho landscape as his inspiration for both pallet and composition. Ricks was also a highly regarded instructor himself and was instrumental in affecting the careers of several prominent Western painters and artists.